Today, 17 August 2012, Indonesia celebrates the Independence Day, so I wrote a poem, “A Prayer for My Country”. my country be sweet, my Lord. but also their soul, my Lord. and be content with humility, my Lord. prayers be answered, my Lord. and love become their only way of life, my Lord. I love your poem for your country.May your prayer come true.You are an inspiration to all of us.Salaam. Great to hear from you,Zein.I love Tagore’s poetry.All the best to you! I am so sorry to hear that it’s been such a tough year Subhan. Your posts have been as full of hope and inspiration even through your darkest hours and that can only be a sign of your inner strength. I totally understand that you have not written about this side of life in your blog. Soul-baring is something I am not very comfortable about too. Yet, knowing how much to share and with what intention and purpose we share our more personal stories is an art in itself. Knowing you, you will know when, what and how much you share and that your heart will feel right. I have learnt never to go beyond what I am comfortable with. I am so confident that even from this dark days, some of your best works will emerge. I am happy to know that you find much joy blogging. It is obvious your readers love and admire your work greatly. As do I. Well, you know I am just a blog away if you ever need to talk. I am much honoured that you wrote. I wish you success and may the sky open up with a fresh ray of sun upon your face. You take good care ok and will be in touch. Thank you Zein.I appreciate your kind words.You know in life we get good and bad experiences,while we are happy when it is good and sad when it is the opposite.It probably will make us stronger in the end.God bless you! I love your poem,thank you! I just read this – it’s beautiful and so meaningful. Thanks. Tendersweet words of praise that sow seeds of heavenly joy in return! Beautiful post my brother! A beautiful post, Subhan. I hope those that need to hear it the most will listen and take action. Subhan, this kind of expression is deeply needed and powerful. May all of our nations join you in this prayer. Blessings to you. Dear Subhan, this is such a sweet prayer for your country. Blessings upon you, and your country! Independence is a wonderful thing to cherish and celebrate. Oh, dear, dear Subhan, I join you most fervently in this prayer for my own country, the U.S.A.
Beautiful as always. Hope this special day was a good one. Thank you. This is my own prayer, but you said it better than I ever could. A lovely tribute to your country as only you could give it! Congratulations to you and your country. This is a beautiful prayer and one that every country can pray because the state of this world is precarious. We all need the peace that prayers bring. 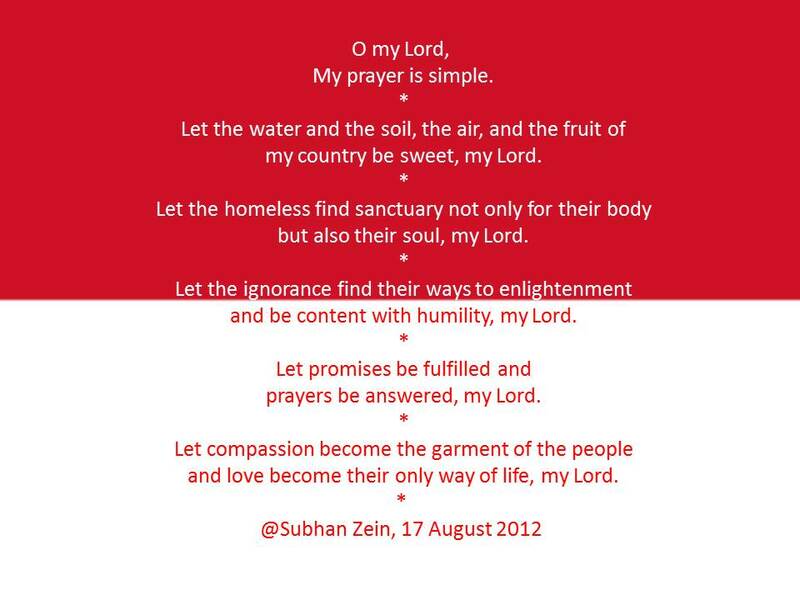 Many blessings to Subhana Zein who authored this prayer. I love independence day…in any country. And your prayer is inspired! Thank you! I wish your country happy birthday and that your prayer is realized in the hearts and mind of the Indonesian people. I have two beautiful Indonesian friends. One of them is a Pastor of one of the largest churches in Jakarta, Jeffrey Rachmat, and I had the beautiful privilege of working as co-editor on the second revision of his first book, The Art Of Winning. He and his family are beautiful people. Amen, many blessings to you, Linda. A prayer should be like this. A simple one from a devotee. Dirgahayu. Subhan, I echo many of the comments made here. A beautiful prayer! One that all nations would be better for if this prayer was prayed by them. Let their be peace in the valley, on the mountaintop and in all the hidden places of our hearts! Subhan, that is beautiful, so meaningful…. Thank-you, Subhan. I am glad that now… I can read your posts. I finally figured out how to get the emails to come to my email address when you post. :))) Sometimes it takes a little time to figure out things! Hi Granny, thank you for the link. I’ll pay you a visit. Since you’ve brought up the subject, I was wondering how you solved the riddle. Some other fellow bloggers also said the same thing. They couldn’t get the emails to come to their email address when I post something. This has been quite problematic and I’d be most grateful if you could share ith me how you technically managed to get it done properly so I could share it with others in my upcoming post. Thank you very much and I’m looking forward to hearing back from you. Subhan… it’s hard to find the right place everytime in order to go to where there are little boxes to check to receive the emails from blogs. It’s wherever you see ‘manage your subscriptions’…. also, it seems there’s another place. It’s not a simple thing to do. Great! Thank you very much. I am sure many people including myself with benefit from this. What a beautiful prayer. Wouldn’t the world be an amazing place if all countries adapted those values? Merdeka! I love to celebrate any Independence Day, hope you have a great one!